In the first two parts of this series we talked about AWS and Cloud Volumes ONTAP® (formerly ONTAP Cloud), and Azure and Cloud Volumes ONTAP®. Now we’ll go into some of the other cloud-based file share services available, namely Google Cloud Platform and IBM Bluemix File Storage. The main difference that we’ll see with the file share services offered by Google and IBM clouds is that their options are much more hands-on than the fully-managed solutions offered by AWS and Azure, Amazon EFS and Azure Files. We’ll also take another look at Cloud Volumes ONTAP and see how its storage efficiencies and high-availability options add value to the end users. Google Cloud Platform offers two options for file share services. The first is based on GlusterFS, which can be used to distribute a file share across multiple virtual and physical machines in order to provide scalability and resilience against failure. Though GlusterFS is open source, commercial support is available from Red Hat. Gluster storage supports a wide range of different storage configurations, including distributed, striped, replicated, dispersed, and a variety of combinations of those. The filesystem also supports Google Cloud Platform backups through snapshots, as well as snapshot clones, and can serve out data over NFS, SMB, and even iSCSI through the use of different drivers and add-ons. As setting up the GlusterFS open source platform is on the end-user, this is not a solution for the faint-hearted. You’ll be expected to roll up your sleeves in order to set the system up and resolve any issues that may arise on your own. It should also be noted that this solution is not specific to Google Cloud, and can also be deployed on AWS or Azure. The other option available on Google Cloud is Avere vFXT, which can act as a caching proxy on top of Google Cloud Storage. Clients are able to access data over NFS and CIFS, leaving the filer to manage the actual persistence to Google’s object store in the back end. Avere virtual appliances can be clustered and offer many advanced features, such as integrating with your on-premises Avere NAS devices to create a global namespace. This solution is more suitable for high-end systems, as is reflected by the pricing. IBM Cloud’s File Storage offers highly available NFS file share services with a sophisticated feature set. Setup is performed through the platform’s web-based UI, which allows for disk performance to be specified in terms of IOPS per GB. Users can choose between the Endurance Tier, selecting one of three fixed levels of included IOPS, and the Performance Tier, where they can manually enter the level of performance they need. Storage management features include space efficient snapshots, data replication and even volume cloning, in order to rapidly create writable copies of existing shares. Data is also encrypted at rest to ensure information security. These features, however, are not currently available in all regions, as File Storage is still in preview. Pricing is dependent on the level of IOPS per GB required. At the low end this can be very cost effective, however, at the opposite end of the spectrum, it can be the most expensive option within this series. Another thing to note is the limit of storage capacity; currently, only shares of between 20GB and 12TB are supported. One of the added values Cloud Volumes Cloud provides when it comes to cloud-based file share services is the full set of storage-efficiency features that make it capable to decrease storage costs both in the cloud and on-premises. The space-efficiency technologies—such as thin provisioning, data compaction, compression, and deduplication as well as data tiering, data cloning and efficient snapshots— are core to the ONTAP system. The cost-savings can be examined using NetApp’s Azure calculator and AWS calculator. Cloud Volumes Cloud also helps protect your data with snapshots that can create instant backups of your data, no matter how large the dataset. These snapshots can also be used to create flexible data clones, which are writable snapshots of your dataset, with zero capacity penalty and almost zero time to create. These clone copies can be used for a number of purposes, but chiefly for testing, where they will have no impact on your workloads’ normal operations. Another added value that comes with Cloud Volumes Cloud is its high availability option, where two Cloud Volumes Cloud nodes are provisioned to support multi-region deployment. With this configuration in place you can ensure that, in a failure scenario, business continuity will be maintained with no data loss (RPO=0), minimal recovery time (RTO < 60 secs), and a seamless failover to the secondary node and failback to the primary when the failure is resolved. Cloud Volumes Cloud is optimal for orchestrating hybrid architectures, which take advantage of traditional on-premises storage and public cloud storage infrastructure, as well as multi-cloud architectures. Both hybrid and multi-cloud architectures provide users with a way to avoid cloud vendor lock-in. While the Google and IBM cloud-based file share services discussed earlier in this article require a degree of effort to configure, Cloud Volumes Cloud requires much less. In a large part this is due to the use of the OnCommand® Cloud Manager, which is used to deploy and manage Cloud Volumes Cloud instances. Available on both the AWS and Azure Marketplaces, OnCommand Cloud Manager uses a simple wizard-based interface to walk you through the setup process provisioning volumes and disk aggregates, setting up new storage systems, and creating new file shares. This functionality can make cloud operation much more user-friendly, but it still retains a level of access developers would like to see: every function that OnCommand Cloud Manager is capable of carrying out can also be carried out using a RESTful API, which comes in handy for DevOps and other workflows. 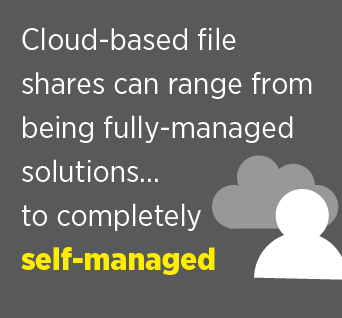 As we have seen in this series, cloud-based file shares can range from being fully-managed solutions, such as Amazon EFS and Azure Files, to completely self-managed, such as GlusterFS in the Google Cloud Platform. Options such as Cloud Volumes Cloud and Avere vFXT exist somewhere in the middle, offering an advanced feature set aimed at users that need more control over their data. Cloud Volumes Cloud covers a wide set of use cases, with licensing options available for small to large enterprises, whereas Avere seems more suited to caching and proxying for high-end NAS users.Whichever solution you choose, it’s important to test it out with a proof of concept to make sure it’s going to meet all of your specific requirements. With Amazon EFS and Azure Files, this is easy to achieve using the capabilities of the respective free tiers. Though this is also possible for GlusterFS in the Google cloud, more work would be required in order to get a test system up and running. For Cloud Volumes Cloud, NetApp is making it even easier: right now Cloud Volumes Cloud is available as a 30-day free trial on AWS, with $100 of free AWS credit to get you started, or as a 30-day free trial on Azure.